(CNSNews.com) - Rep. Alexandria Ocasio-Cortez (D.-N.Y.) sent out a series of Tweets on Saturday night condemning what she sees as systemic injustice in the U.S. justice system. “All too often, our criminal justice system—from tickets to convictions—is treated as a game, where the one racks up the most ‘points’ wins,” she said. “Paired w/foolish criminalization of marijuana, poverty, etc., it wrecks chaos on people’s lives + stagnates communities for generations,” she continued. 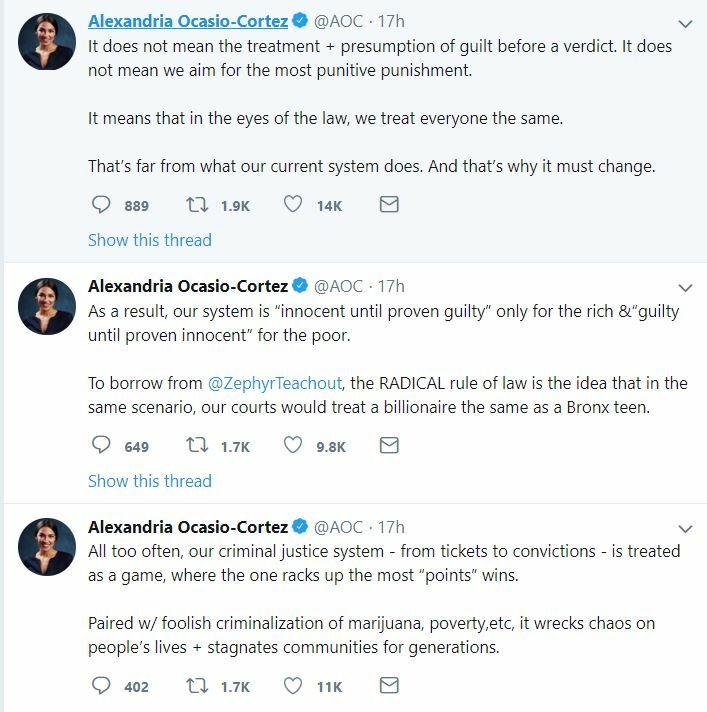 “As a result, our system is ‘innocent until proven guilty’ only for the rich & ‘guilty until proven innocent’ for the poor,” Ocasio-Cortez continued in a following Tweet. In following Tweet, she said: “It does not mean the treatment + presumption of guilt before a verdict. It does not mean we aim for the most positive punishment.